Amazon India allegedly ships a brick instead of a OnePlus One to a customer? A gentlemen who lives in India by the name of Maninder Walia, claims to have received a piece of a brick from Amazon India instead of the OnePlus One handset he ordered. 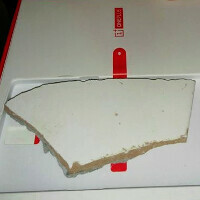 Images posted on the man's Facebook page show what appears to be a piece of a brick sitting inside a OnePlus One box. Peeling away some of the tape used on the outside of the package, revealed that it had seemingly been tampered with. Thieves will often remove a device from its box, replace it with something that weighs approximately the same, re-seal the box and sell it at a "bargain" price. Back in October 2012, a box that was was supposed to contain an iPad, purchased from a Walmart store for a birthday present, contained only notepads inside. One month later, a similar incident took place. A lady purchasing an iPad from a shady character standing in a gas station parking lot, lost $200 when the sealed box contained a mirror instead of a tablet. Amazon has told Mr. Walia that it is looking into the matter. Based on a comment he made, it seems that the purchase cost him the equivalent of $340 USD. It would also seem that the phone that was swapped for the brick fragment was supposedly the 64GB Sandstone Black version of the OnePlus One. If anything new develops with this story, we will let you know. For now, the investigation continues. Maybe Oneplus One 2.1 version? Feeling sad for him. But he should have not received/accepted the tampered package. Yes. I got even on my G Watch R box "Do not accept if seal is broken." Wow, Jeff Bezos is still pretty pissed about that Fire Phone isn't he? I've bricked plenty phones with custom roms but this is ridiculous. At least it wasn't an iPhone because if Apple had their way they'd send anyone who jailbreaks to jail. Damn!! best value for money, do we need invite for that brick? Where should we register Carl?? Maybe this is around third odd incident in India. There were also persons who received mangoes and onions instead of mobiles. Oh yeah, I'd definitely have a mango over an apple! Who wouldn't? Guys, I didn't accept the tampered package. It was only after i found the brick instead of phone. I checked under "Amazon" tapes. It was then i came to know the package was damaged.